Texting adds another way to communicate effectively. These days doctors, dentists, airlines, hospitals and many other organisations use text messages to contact people urgently and reliably. You must, of course, get permission before adding anyone to your email or texting lists. We suggest sending emails a week in advance and text messages the day before an event. Plus texts for extreme urgency - e.g. meeting cancelled due to bad weather. Normally you pay for each text you send. Many of us have a mobile phone package which includes more "free" texts than we need ... so we can use those. Normally you pay for each text you send. Many of us have a mobile phone package which includes more "free" texts than we need so we can use those. Skype can be a completely free video-phone system for reaching other Skype users, but if you also open a Skype credit account - giving them a small deposit against future charges - you can ring regular land line phones (often cheaper for overseas calls) and you can send multiple texts for which there is a small charge. In the text window click Add People and start sending your text messages. You can add contacts (hold down the Ctrl key on your keyboard to select multiple contacts) or enter a mobile phone number in the box provided. When you’ve added your contacts, click Select, then click Add to add those contacts as recipients. You can send to up to 50 members at a time, but you will still have to pay for each text message that you send. For example, to send a text to ten recipients you will be charged for ten text messages. Current price within UK is 6.4p a message, so 64 pence. Long text messages may be split into two or more separate "texts" and each is charged for. There are various programs you can download, which will let you send group messages by SMS text ... but we have suspicions that many of those exist to collect phone numbers for onward sale to advertisers. If you choose to go that way, make sure they handle UK texts and that the charge is not ridiculous. Both of those video hosting websites offer a chance to present your videos to the world ... but they can also have promotional benefits. When you join YouTube you are automatically assigned your own channel, so join in the name of the club and the club gets its own channel. You can add a suitable image/logo, some information in the profile section about the club ... and, of course, upload videos. They show their club website address on the right of the title banner. You can see a few of their videos at the foot of the page and the arrow at the right indicates there are many more to see. 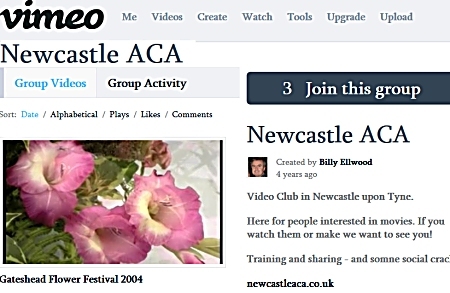 Set up such a channel for your club, then upload club videos and videos from individual members so that people who find the channel will be intrigued and will click the link to visit your website. It is a good idea to create what YouTube calls a Channel Trailer. Their notes on this are here. Unsubscribed new viewers will see your channel trailer first if you enable the channel trailer view. It will autplay so keep it very short. We also think it worth exploring the possbilities of Annotations (see here) which would let you, for example, superimpose the club's web address on the last moments of every video on the channel. There is a chance to write a welcome and description, give the website contact details and so on. There are many, but Facebook and Twitter rule. We don’t have to stress the amazing ability of these media to foment revolutions, manufacture celebrities or inspire generosity. For a club their importance is that they can develop and sustain groups of every kind. So what makes your club any different? A few clubs advertise Facebook sites whilst Twitter has never been used seriously by our clubs, so far as we can see. However only one or two clubs have made really good use of Facebook which means providing a regular supply of interesting info / updates / encouragement / event details / useful links etc. never set up a page and leave it to die of neglect. If you want to see how it should be done, we suggest you look at Reading Film & Video Makers in Facebook. (You do not have to join Facebook to read their page.) We counted 77 entries in 8 months conveying the clear impression of an active, busy, involved club membership. To set up your own page, first check out the type of page to make (see here) and then go to "https://www.facebook.com/pages/create" and follow the instructions. Be careful to set its privacy controls to OPEN otherwise the page is not normally viewable by non members and does not appear in search engine results. That makes those pages pretty useless for publicity purposes. Click the "Company, Organization or Institution" button under "Create a Page." Select a category from the "Choose a Category" drop-down list. For a club, you might want to choose the "Community Organization," "Non-Profit Organization" or "Organization" options. Click the check box to confirm that you agree to Facebook's terms and conditions for Facebook Pages. Click the blue "Facebook Pages Terms" link to read the details. Type your club name into the "Name" input box. Click the blue "Get Started" button. Does it have any additional benefit, is it worth investing time and energy or is it just for global show-offs like Stephen Fry? We asked Geoff Harmer of Fraught Productions (www.fraught.net) about it. Geoff is the maker of BIAFF successes like Overtime, Room 4 and Addict and a regular contributor to the IAC website forum. Social Media sites and tools are essential weapons in a film maker's arsenal when it comes to promoting their work/club. Facebook has 1.15 Billion users, Twitter 200 Million, and YouTube has more than 1 Billion unique user visits each month... who wouldn’t want to tap into that to help promote their work? Ways in which you can use these sites to help promote your film or your club are many. Within Facebook, I have created a specific “page” that is just for my film making collective. On it I ensure I post regular updates on whatever is going on with my film making. It’s essential to keep the posts fairly regular as this will increase the chances of traffic to your page and thus help promote the work that you are doing. I’ve also created pages for specific films that I’m working on, there are a number of reasons for this. First up, it’s a good place to keep everyone up to date with the production and promotion of that film, as well as having the ability to share pictures and videos of the production. Once you have a page for a film it’s easy for friends and followers to share and link to, this comes in handy for things like Crowd Funding and even IMDB registration. You’ll also find a lot of film festivals these days ask if there is an Official Website for the film, Facebook is a very quick and easy way to set something up. Twitter is a different tool. It gives you the chance to send a short message out to the masses, which can contains links, photos, videos, etc. Because you don’t have to know the person that is tweeting, your words can quite literally reach thousands of people. The best way to widen your audience is to use hashtags. Hashtags are a form of meta data that you associate with your “tweet” which will allow your words to be seen by more people, as well as help aim it at the more appropriate audience. Within Twitter and other search engines, you can browse a specific hashtag and find all tweets that contain it. Let’s say for example you were making a film about a specific town (say Basingstoke), you could make sure you add #basingstoke to the end of your tweet. That way, anyone searching Basingstoke, will have a chance of coming across your message. When I was promoting a Crowd Funding campaign I was running, I found Twitter to be the most productive method to get the word out there. It was fast and to the point, and was easily retweeted by people who wanted to help, thus helping spread the word on the campaign. 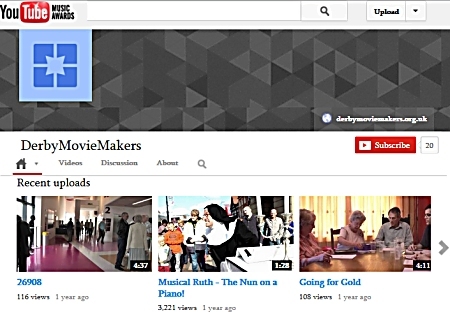 YouTube is a video sharing website and is an amazing tool for giving people the ability to share their films and work. Once you have uploaded your film to the site, you can embed the film into forum posts, websites, emails, and other web based sites and pages. It also collates the number of hits you’ve had, where they are coming from in the world, the sort of demographic that is watching (gender, age, etc) as well as how they found the film, what they watched it on (laptop, phone, etc) and even how much of your film they watched! This is great for trying to understand your audience, but it tends to just be a curio for me. It really is all about the ease of sharing the content. The problem with YouTube is that you can quite easily get lost in the crowd, you do need to complete your tags with as many key words as you can. All 3 of the above are great tools for getting your club/film out there... but you still need to put in the hard work of promoting. As promotional tools each site is great, but for the best exposure you really need to use all 3 platforms in combination to maximise your chances of getting new followers/members.